Inspired by her children's need for products developed for ultra-sensitive skin, Christine Burger founded Noodle & Boo. Working with professionals who specialize in natural, holistic skin care each exclusive formula is developed to nourish, replenish and protect especially delicate and sensitive skin. 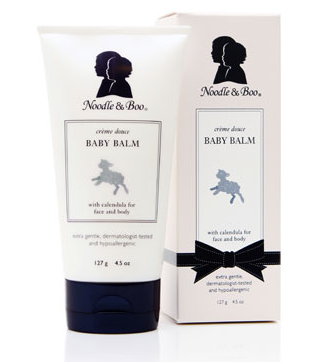 The company is lovingly named after Christine's two young children, Andrew and Matthew, also known as Noodle and Boo. More recently, on a goodwill trip to Ethiopia, Christine met her daughter Dibora who rounds out the family perfectly. Noodle & Boo is committed to creating the highest quality products using the finest ingredients. Each ingredient is chosen based on proven historical data and appropriateness for a given product, not for marketing propaganda. Ingredients are derived from natural resources and are 'certified organic' when available and safe to use. Made in the USA, Noodle and Boo's products are manufactured in an FDA-approved, pharmaceutical environment to ensure product quality and integrity. Every formula is hypoallergenic and clinically-tested to minimize the risk of allergic reaction, as well as dermatologist-tested to verify optimality for skin sensitivities. Additionally, their children's products are pediatrician-tested to ensure every consideration is taken to meet the needs of their youngest customers.